There are no signs the U.S. would actually invade Venezuela, but the rhetoric in Washington and Caracas appears to have helped President Nicolas Maduro convince ordinary Venezuelans that U.S. marines could hit the beaches at any moment. Caracas is a city where everyone knows the dominant political affiliation of each neighbourhood. Basically, the east belongs to the opposition, much of the west to the Chavistas. Many opposition supporters would be reluctant to venture into the poor barrios where President Nicolas Maduro can still find support, and foreign journalists who visit them are sometimes met with considerable hostility. But CBC News found only kindness and hospitality when we visited the Marin barrio in San Agustin parish, a towering ridge of cinderblock houses and corrugated iron roofs that is served by a cable car built 10 years ago by the Chavez government at an exorbitant (and heavily padded) price. Most of the residents CBC News spoke to in San Agustin agreed about one thing: they don't like Venezuela being threatened with potential military action by the United States. "The psychological warfare is very strong," says Reinaldo Mijares, who's lived his whole life in this neighbourhood. "It's been tough for me to sleep, because I'm nervous. I don't doubt that the gringos, with their desire for hegemony, can invade any country in the world, and that includes Venezuela. "In history, we have cases where they've created an atmosphere, and a self-justification, to allow themselves to invade countries. They've been doing it for 200 years, but more recently, they're doing it right now in Syria. They did it in Libya, and they did it in Iraq." Maria Lourdes Rodriguez speaks through the iron bars that cover her window. She apologizes for not opening the door, but she's cleaning. She says that for the U.S. to occupy Venezuela, "they'd have to kill everyone here." Does she really think they'll do it? Venezuela's crisis: Why now and what's next? "No, because we have Russia and China, and they won't let it happen. The [oil] deposits belong to us, and with them, we'll be able to move forward." While the U.S. has a long and controversial history of involvement in South and Central America — including in Chile, Panama, Nicaragua and elsewhere — if it's planning to invade Venezuela, it's certainly not doing much to prepare for it. Anyone who remembers previous operations like Desert Storm or the invasion of Iraq, and even relatively minor ones such as Panama in 1989, knows the U.S. only goes to war after a long and highly visible buildup. Leaves are cancelled, planners work around the clock, troops train and ships assemble. The fact that none of that is happening fits with what most U.S. military experts agree on: the U.S. isn't about to invade Venezuela, and U.S. President Donald Trump's talk of a military option sounds hollow. But the rhetoric appears to have helped Maduro and the United Socialist Party of Venezuela convince ordinary people, such as those in San Agustin, that U.S. marines could hit the beaches at any moment. 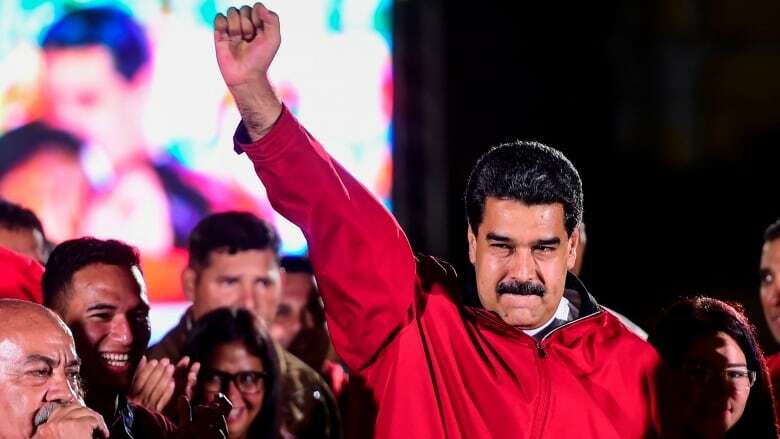 On Saturday, Maduro ordered the incorporation of the Socialist Party's Bolivarian National Militia — a force the government has claimed is 1.5 million strong — into the armed forces. It represents another step in the politicization of a military in which soldiers already salute officers with a shout of "Chavez lives!" Next Sunday, Venezuela will launch an enormous military exercise called Operation Angostura 2019 lasting five days. According to the armed forces, it will involve "nearly two million men and women." Maduro tweeted on Monday about a visit to a naval exercise: "Men and Women of the Sea … I call on you from my worker's heart to show maximum cohesion and maximum preparation. Loyal always like Sucre! Traitors never, like Santander." Maduro, a man who is famously fond of the ceremonial, appears to have devoted most of his waking hours this week to a series of marches, rallies and displays of loyalty designed to shore up the connection between the government and the armed forces, which is called Civic-Military Union in official Socialist Party dogma. He tweeted: "We patriots are standing and in Civic-Military Union, raising the banners of respect the dignity and honour of our nation, against those who call for imperialist intervention. Venezuela will never surrender!" And yet, outside the government's strongholds such as San Agustin, the efforts to whip up invasion fever are being met mostly with derision. One Maduro propaganda video that showed the president boldly striding forward, arms locked with men in uniform, was clearly intended to project an image of unity within the armed forces at a time when some service members have been defecting and using social media to call on others to follow suit. But the message backfired when an opposition troll set it to the tune of the Village People's 1978 hit YMCA, and it soon proliferated over YouTube. The Socialist Party and the Bolivarian Armed Forces can't control what people post on platforms such as Twitter, and their posts are usually followed with a deluge of disparaging comments from Venezuelans who no longer feel the same respect for the military institution they used to. Chief Admiral Remigio Ceballos's tweeted last week: "We don't accept foreign interference …. We are loyal to our President and Commander in Chief Nicolas Maduro Moros!" A Venezuelan citizen responds "You're a traitor to the nation, this is how Venezuela sees your armed forces." But if the odds of a full-scale U.S. invasion are slim, there are reasons to take more seriously the prospect of conflict between the Venezuelan and Colombian armed forces. The two "sister nations" that were once one Gran Colombia in the time of Simon Bolivar have taken very different directions politically in recent years. Colombia's President, Ivan Duque, has never hesitated to call Maduro a dictator, and there have been minor frontier skirmishes in recent months over disputed islands in the Orinoco River, as well as threats by Venezuela's former foreign minister, Roy Chaderton, to invade and annex Colombia. In August, Venezuela's military placed missiles and other weapons along the border near Cucuta, where hundreds of thousands of Venezuelans fleeing economic meltdown have crossed into Colombia. A plan by opposition leader and self-declared president Juan Guaido and the government of Colombia to set up a depot in Cucuta and ship humanitarian aid into Venezuela has been met with threats that it will be turned back. In recent days, Colombian troops have been pouring into the region, and Venezuela has used tow-trucks to ship artillery to the border. While a full-fledged war between Venezuela and the U.S. seems highly unlikely at this point, the conflict on the border certainly has the potential to turn violent. 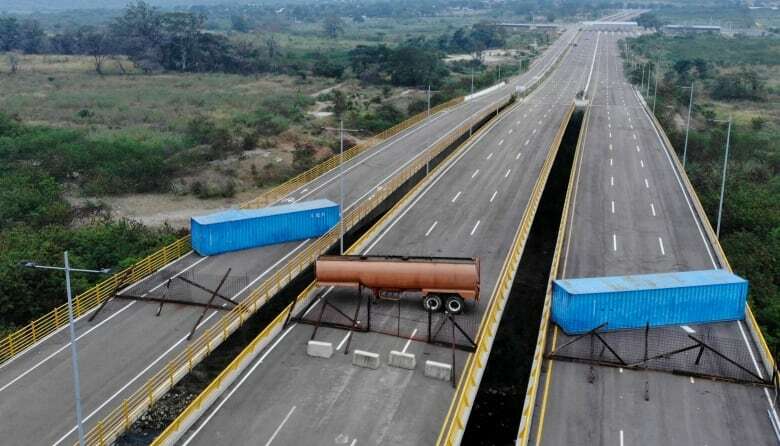 On Tuesday, Venezuelan troops further blocked the Tienditas Bridge, an unused border crossing between the Cucuta area of Colombia and the Venezuelan town of Pedro Maria Urena, with shipping containers and a tanker trailer, as Maduro reiterated his intention to block all international humanitarian aid. "Nothing will enter," he said. In Pedro Maria Urena, a local congressman tweeted pictures of Venezuelan armoured personnel carriers being surrounded by people who want aid to be allowed to enter. The tweet read: "#Just now #Frontier municipality of Pedro Maria Urena they brought armoured cars to intimidate the people, when the truth is that all Venezuelans are waiting for #humanitarian aid. There are three people injured and some motorcycles destroyed by those armoured cars. The townspeople stopped them." This story has been updated to reflect the fact that the Tienditas Bridge between Colombia and Venezuela is an unused border crossing. Built in 2016, the bridge has never officially been opened amid ongoing tensions between the two countries.